Nyitva: hétfő kivételével kedd - szombat 10 - 18 óráig, vasárnap 10 - 16 óráig. The concept of contemporary art is quite diversified and controversial: it is certain, however, that in most cases it reflects on current problems of our present, namely it has actuality. It not only reflects, converts to visual form time’s (social, political, moral or artistic) problems, but it makes relationships visible and acts as a channel of communication. It transmits, reinterprets, models. The technical and genre-related frames of its act are very broad: not only the stylistic or technical issues of contemporary art are interpretable and interesting, but the intermedial approach created by their linking also tends to realize the communicative function of fine arts as reflected as possible. 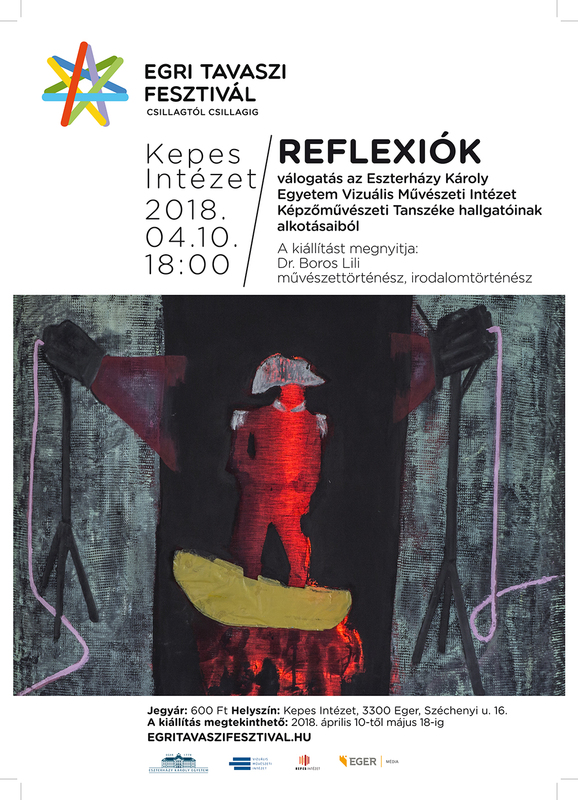 It attempts to show the complexity of the possibility of visual perception just as much.The exhibition entitled Reflections offers a selection of the most recent and high-quality artworks of the painting, printmaking and nature art and the visual and environmental culture teacher training specialization of the Fine Art Department. Although the primary purpose of the training is the acquisition of basic technical skills, it also aims to provide students a complex practical, creative and theoretical knowledge, as well. As a result, it facilitates the realization of autonomous visual thinking and the expression of the creative energies in artistic creation. The personal approach, self-reflection that derive from the students’ age are always current, since the in-depth research in the field of soul and emotions always remain in the forefront of human interest.